See also imitating menus with blocks. Since the settings.js file is loaded before the DrupalGap bootstrap, we can't place dynamic argument values in our menu links. 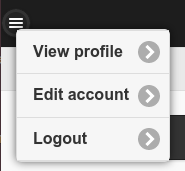 A common mistake is to place the Drupal.user.uid in a menu created via the settings.js file. This unfortunately won't work (for now). But we can easily get around this problem by creating a custom block like we did above. Remember, we're not actually creating what DrupalGap considers a menu here, we are simulating a jQuery Mobile menu, inside a DrupalGap block. In the future DrupalGap, will have a more flexible menu system, but for now this approach works great.